Located in the north of Mallorca, the bay of Alcudia is by far Mallorca’s longest beach offering a great opportunity to soak up the sun or take part in watersports along its well developed infrastructure. The perfect beach for a family day out! Cala Pi Beach is located in southern Mallorca. 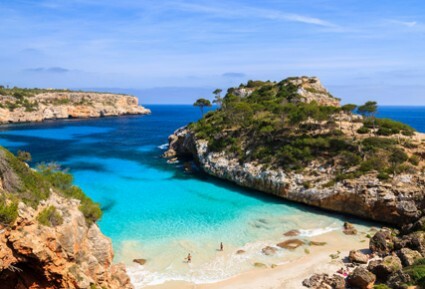 Busier than other Mallorca beaches this golden sandy gem offers a great atmosphere, local amenities and a lot of room to find your own perfect relaxing spot. Spend the whole day relaxing by the clear blue waters while watching the beautiful Mallorca sunset. If you’re looking to get away from the crowds head west to the Cala Deia beach, here you will find a rocky hideaway with sparkling transparent water, perfect for watching the sea life in their natural habitat! If you're lucky you might see one of the many celebrities who own a holiday home nearby such as Michael Douglas & Catherine Zeta-Jones. If you want to get more close to nature, Es Trenc’s beach is highly considered to be one of the best in Mallorca. Offering more than 3 kilometers of beach, backed by natural sand dunes, many flock here on a daily basis but if you want to get away from the hustle and bustle of everyday life, this beach also offers quiet retreats the further away from the car park you venture.